If you haven’t been to the show at Darcelle XV Showcase it should be on your list of things to do in Portland especially after learning about the evolution of the business and the story behind the couple that created it . On Sunday, November 13 I attended a birthday bash at the showcase to celebrate Darcelle’s 86th birthday and it was quite an entertaining and uplifting evening. As the drag queens lip synced and danced, I witnessed what an impact Darcelle has had on her community! Equally enjoyable was the time I was able to spend interviewing Walter Cole and Roxy LeRoy. 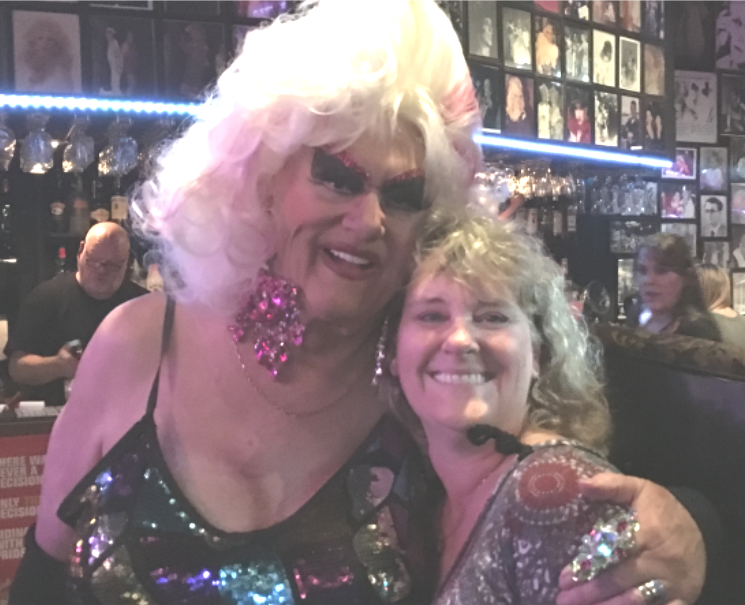 We talked about their lives, the many changes in Portland over the last 86 years, and the creation of Darcelle XV , the showcase venue and the drag show. Walter Cole was born in November 1930 in Linnton, Oregon, a little mill town north of St John’s. Linnton was inhabited by Italians who owned many of the businesses in town and also many Czechoslovakians who worked at the three sawmills. Cole’s father worked at a sawmill and made about a dollar a day. Some things don’t change, like Highway 30, which was the only paved street in Linnton and still runs from Portland to Astoria, or Linnton Feed and Grain, which is still in the original building today. However many things in the Portland area have changed drastically. Cole enjoyed life in the late nineteen thirties and forties. He remembers taking the streetcar to Portland with his mother to get pork noodles and to visit the almost dozen movie theaters on Broadway, Stark, and Park. One theater would play only Westerns while another would play only newsreels. Ironically, their favorite place to get pork noodles was the Mandarin Café, which is right across the street from where Darcelle XV Showcase is today. The Café’s sign is still on the building. Cole didn’t always have it easy, however. He went to Linnton Elementary School and was bullied as a kid since he was different. 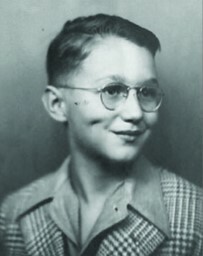 He was called sissy boy and four eyes which, he says, “was not very pleasant .” There was not really a word at that time for what we now call gay. “Back then gay meant happy,” says Cole. Kids from Linnton had a choice of Roosevelt or Lincoln high school. He chose Lincoln because it was only one streetcar stop to get there. Also, he didn’t like most of the kids that he knew from Linnton who were going to go to Roosevelt. He worked hard as a page at the Multnomah Athletic Club, along with several other jobs. After graduating from Lincoln High School he married his high school sweetheart from Linnton, Jeanette Rossini. They married after high school because, as Cole said, “that’s what they did back then. You stayed in your family home until you got married. You either got married or went to college and, since we didn’t have 2 nickels to rub together, we got married.” After getting married in May 1951, Cole joined the Army and by September he was in boot camp and off to Italy. The Korean conflict was going on and he was stationed in Livorno, Italy at the army headquarters. In 1955, after his son was born, he bought a house near Jean’s parents for $11,500. “I signed shaking. I thought I’d never see that kind of money in my life. Payments were $99 a month and that included insurance. I cleared $175 a week so there was not much left over,” says Cole. By the late fifties, Urban renewal starts to have an impact on businesses throughout the city. Caffe Espresso’s first location was a victim of this urban renewal with notifications of 30 days to vacate and a check for $5000. So Caffe Espresso relocated to SW 3rd and clay behind what is now the Keller. In addition to the coffee house they added a basement after hour’s jazz club, Studio A, and famous jazz musicians like Buddy Rich and Cal Tjader would come by after their concerts and after the bars closed and jam all night. Unfortunately, urban renewal took that too. To make some extra money, Cole had opened an ice cream shop on SW 12th and Montgomery called Café Trieste. He hired a manager but when urban renewal closed Caffe Espresso, Cole laid off the manager and started working at the ice cream shop. For the third time, urban renewal struck. Café Trieste closed and Cole bought the Dimas tavern at NW 3rd and Davis right in the middle of skid row. “Trust me, it wasn’t Old Town then, it was skid row…winos and you name it,” Cole says. 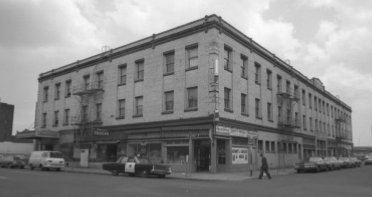 Bill Naito, businessman and developer, owned the building so Cole leased the space as well as the space next door both for $200 a month. The idea was to open a gay bar but no one would come north of Burnside so Cole hired a lesbian friend who convinced her friends to come to the tavern. Cole explained that the show was originally meant to distract the customers and keep them from fighting. Live performances were only allowed in night clubs at the time, but the tavern was able to host this show because it was technically lip syncing. The police didn’t know what to do with these lip syncing acts so they pretty much left Cole and his drag queens alone. Only once were they written a ticket for having a live performance but by the time the court date came around the law had changed so the ticket was dismissed. In 1973, Cole was elected the Empress of Portland for the Imperial Sovereign Rose Court of Oregon which raises tens of thousands of dollars every year for charities. Cole was the 15th Empress and now they have 56, so with his drag queen name being Darcelle coupled with the year of the Empress title they changed the name of the tavern to Darcelle XV. The club continued its successful run and, as of September, has been operating nonstop for 49 years. In addition to the Old Town area of Portland where Darcelle XV Showcase lies, the Eliot neighborhood has played a big part in Cole’s life too. In 1969, Walter met Roc Neuhardt, aka Roxy LeRoy, when he was a choreographer for the Hoyt Hotel and subsequently asked him to choreograph the Darcelle XV Showcase shows. That was 47 years ago and Roxy still choreographs the shows today. Cole explained that “at that point there were not a lot of rentals [and] more home ownership. It was very neighborly,” adding, “it was more neighborly than now.” However, they love the neighborhood and have met so many nice people in the years they have lived here. They were never bothered for being gay and say that there are now quite a few gay families living in the blocks surrounding their house. They also own a couple of other houses on the block, so they have a vested interest in staying connected with the neighborhood. They think that Eliot is a great neighborhood to live in, given its proximity to the city and the diversity it offers. Cole says he can’t believe that life has gone by so fast. “The Scary part of being 85 is having kids that are almost ready for social security!” He has two lovely grandchildren now. Jeanette still lives in the same house in Southeast Portland where she and Walter started out back in the 1950’s. “None of this life was planned,” says Cole, “but it has turned out pretty well and I wouldn’t change a thing .” Cole’s life is an example of what dedication, believing in yourself, and expressing yourself can result in. For more details, stories and information about Cole and the Darcelle XV Showcase, check out the book, Just Call Me Darcelle, which is available at Powell’s Books or on Kindle. For showcase information, call 503-222-5338 or go to www.darcellexv.com.